The forces of evil are poised to prey on the folk of the hamlets and hollows: witches, demons, and red-handed men—but first they'll have to overcome Old Nathan the Wizard. He doesn't claim much for his magical powers, but they're real enough for what they are—and besides, he hasn't forgotten how to use his long flintlock rifle. 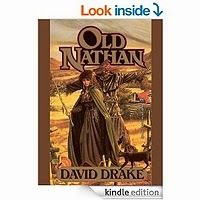 Enter the gritty, realistic world of Old Nathan, a backwoodsman who talks to animals and says he'll face The Devil himself-and who in the end will have to face The Devil in very fact.